The circle of the cross evokes a sense of the world with the cross of Christ anchoring the center and four compass points. The circle, a symbol of eternity, also reminds us that through Christ we have eternal life. The outward flow of lines from the cross, encourage us to carry His light out into our world. When focused on Christ as our anchor and center, we may serve as vessels for the Holy Spirit to flow and work through us, as we take our faith in action out into the world. Purchase price link includes cross and US Priority Mail shipping. To purchase pendant only, click purple price link above for secure online checkout to pay by credit card or PayPal. $90 + $8 US shipping = $98 To order multiple items or add a chain/cord contact me to arrange purchase. loop for chain is hidden. 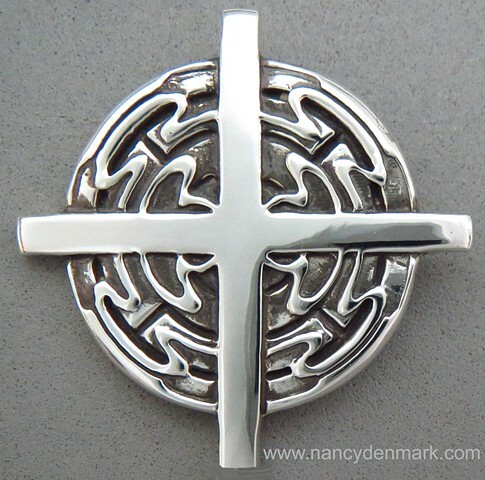 This cross was inspired by the window at Episcopal Church of the Epiphany in Houston, Texas and designed to commemorate their 50th anniversary in 2007. I have been blessed to call Epiphany my home church since 1983.